Ston is a small town in the Dubrovnik area, located at the south of of the peninsula Peljesac. The distance of Ston from Dubrovnik is only 59 kilometres (37 miles). The whole Peljesac peninsula has about 2500 dwellers whereas 600 inhabitants are living only in Ston. 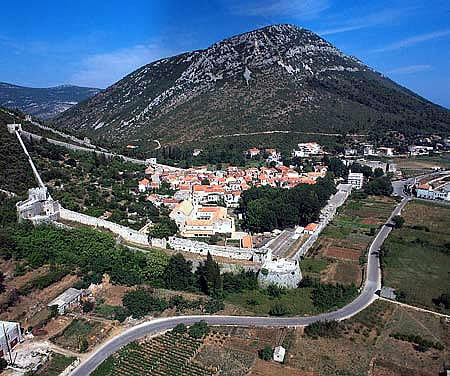 Ston was a military fort of the Ragusan Republic whose defensive walls are among the most famous in the world: there is a 900 meters (3000 feet) long town wall and 5 km (3 miles) Great Wall outside the town. The walls extend to Mali Ston (Little or Small Ston), a smaller town on the northern side of the Peljesac isthmus and the end of the Mali Ston bay. It is noteworthy to mention that Ston walls are the second longest defensive walls in the world, second only to the Great Chinese wall. We are very proud to offer different kinds of excursions and tours to Peljesac peninsula and the town of Ston. Pictures from of one of our Hiking tours to Ston and the hill of St. Michael that included oyster and wine tasting are located at the following link: Ston Hiking Tour. If interested for any kind of tour or excursions, please feel free to contact us for pricing and booking arrangements. We are able to offer you different many custom based excursions and tours visiting Peljesac and the town of Ston. Dubrovnik Republic wanted to include Pelješac peninsula in its territory for a long time as Peljesac offered a profound economic value for the Republic. Peljesac was especially valued for its salt pans dating back to the Roman empire, its vineyards, and much needed arable area. All of those points gave Peljesac an added economic value. Today farming, viniculture, olive growing, fishing, oyster farming and, of course, tourism are the pillars of the Peljesac peninsula economy. The local restaurants offer domestic specialties, especially world famous oysters, as well as other seafood. 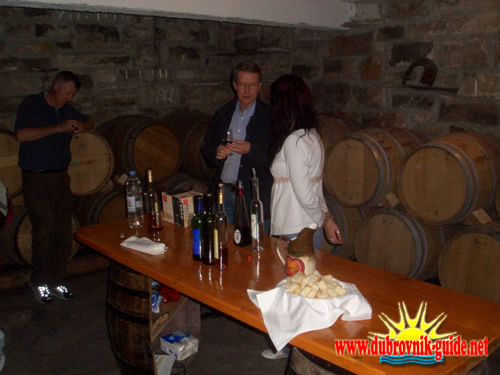 There are many opportunities for wine tasting of the Peljesac wines. The most famous Pelješac wine is called Dingač. The only wine that can be called Dingač is grown only in Potomje Dingač region. The salt works used to be and still are important for Ston. Salt is being produced in Ston up to this very day and informative tours of the salt pans is one of the popular tourist attractions. Coast along the Channel and in the Prapratno cove provides fine swimming, fishing, and sports diving opportunities. The beautiful sand beach is ornamented with centuries-old olive trees, and excellent camp places are situated here. Beside water sports, there are many sports grounds designed for tourists recreation. Exerting great diplomatic skills from 1326 until 1333, Dubrovnik Republic made a territory deal with a feudal lord and one ruler of the region thereby getting hold of whole Peljesac peninsula under its control. Dubrovnik Republic ruled Pelješac peninsula rigorously for five and half centuries until its fall in 1806., staying on the peninsula as a main protagonist of urban, social, and economic life. Republic introduced a feudal economy to the whole Peljesac, distributing land to the noblemen and some of the commoners. The others became bondsmen. As soon as Dubrovnik Republic got hold of Peljesac a building project started to secure Pelješac peninsula by detaching it from the mainland. This was realized by a complex fortification system rising between town new-formed towns: Ston and Mali (Small) Ston. The new formed towns and the fortification system effectively defended the important salt panes and were the starting point of the extensive Salt trade that expanded all over the Balkans and give rise to huge profits to the Republic. At the sight of today's Ston there was a Roman settlement Stagnum. The foundations of the Roman castrum can still be seen on Starigrad Hill. In the 10th century Ston was the seat of the diocese, probably located by the church of Our Lady of Luzina. Ston is one of the first, and most beautiful examples of a planned town architecture. 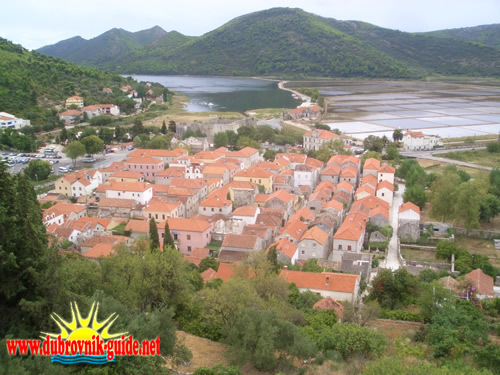 Ston was founded in 1333 with purpose of defending and servicing the Salt pans.. The town was fortified by 980-m long walls, forming an irregular pentagon, with more massive towers on the corners. From the north-western corner the walls rise to the top of Pozvizd Hill, where they merge with Pozvizd Fortress, and from the north-eastern corner they follow the line of the isthmus to coalesce with the walls of Mali Ston. The most massive fortress of Ston, Veliki Kastio, rises on the south-western corner. The wall east of it was running along the coast which borders with the salt works of Ston between the coast and the sea. The huge fortified complex was built by Dubrovnik between 1333 and 1506. Famous masters include: Zupan Bunic 1455, Bernardin from Parma 1461, Olivier the French 1472-1478 and Paskoje Milicevic 1488-1506. Public school was mentioned already in 1389, the almshouse in 1485 (the building still stands there), and the orphanage in 1494. The most representative secular buildings within the walls are the Chancery of the Dubrovnik Republic, built in Gothic and Renaissance styles, Sorkocevic Palace and the former bishop's palace (1573; elements of late Renaissance and the arcade accommodating a collection of stone monuments). The former Renaissance Rector's Palace was expanded and reconstructed in the 19th century. The Franciscan monastery with its Gothic-Renaissance style cloister and the Romanesque-Gothic church of St. Nicholas date back to 1347. The complex holds several pieces of art: a big painted crucifix (a work by Blaz Juraj Trogiranin), the silver frame of the missal, the Gothic wooden statue of St. Nicholas, etc. On the location of the present pseudo-Gothic church of St. Blaise (from 1870) there used to be a 16th-century cathedral (collapsed in the earthquake of 1850); the only preserved remains were the wooden statues of St. Blaise, Sts. Peter and Paul, and the icon of Our Lady by Andrea Rizzo. The parish church of the Annunciation was erected in the 15th century outside the walls, on the location of the former parish church of Our Lady of Luzina. The sacristan's loggia with two big bells cast by Ivan Rabljanin in 1528 is located in front of the church. The well-preserved pre-Romanesque church of St. Michael (9th c.), with valuable early Romanesque mural paintings (featuring the king donor and saints) rises on the St. Michael hill. There are several other old churches in the vicinity od Ston, unfortunately most of them are in ruins now.